Soyuz VI. Forward view showing Soyuz descent module located ahead of cylindrical orbital work compartment. Russian manned combat spacecraft. Cancelled 1965. To determine the usefulness of manned military space flight, two projects were pursued in the second half of the 1960's. AKA: 11F73;7K-VI. Status: Cancelled 1965. Gross mass: 6,700 kg (14,700 lb). Height: 8.00 m (26.20 ft). Chelomei's Almaz was to conduct orbital research into the usefulness of manned observation of the earth, while Kozlov's Soyuz VI would conduct military research. Soyuz VI was developed form the original Soyuz draft project. The standard Soyuz solved problems of docking, EVA, orbital assembly, while the VI was designed in response to a TTZ to solve military aspects - manned earth observation, orbital inspection and destruction of enemy satellites. But by the beginning of the 1970's flight tests had provided convincing evidence that near-earth operations were better suited to solution of national economic problems than military ones. So the Soyuz VI was cancelled. Kozlov was already developing military versions of the Soyuz. During 1963 to 1964 OKB-1 Kaliningrad had concentrated on development of the Soyuz-A circumlunar spacecraft, while the military projects Soyuz-P and Soyuz-R were 'subcontracted' to OKB-1 filial number 3, based in Samara (then Kuibishev), headed by Chief Designer Dmitri Ilyich Kozlov. For Kozlov development of military spacecraft was nothing new. In 1961 he completed the technical documentation for the serial production of the photo reconnaissance satellite 11F61 Zenit-2, and from 1964, Filial 3 undertook development of the 11F69 Zenit-4 reconnaissance satellite from draft project to production. Samara was also responsible for future development and production support of derivatives of the R-7 family of launch vehicles. KB Kozlov began active development of these military versions of the Soyuz in 1964. New versions of the R-7 launch vehicle, the 11A511 and 11A514, were put into development to support their launch. However both spacecraft would ultimately be cancelled and replaced by projects of Korolev's competitor, Chelomei (the IS unmanned anti-satellite replaced the Soyuz-P and the Almaz space station replaced the Soyuz-R). In June 1965 Gemini 4 conducted the first American manned military experiments. The crew tested the military utility of manned photographic and visual reconnaissance of the earth from orbit through observation of ground test patterns and ballistic missile launches. They also tested rendezvous and orbital inspection techniques. At the same time the US Air Force's Manned Orbital Laboratory was on the verge of being given its final go-ahead. These events caused a bit of a panic among the Soviet military, where the Soyuz-R and Almaz projects were in the very earliest stages of design and would not fly until 1968 and the earliest. 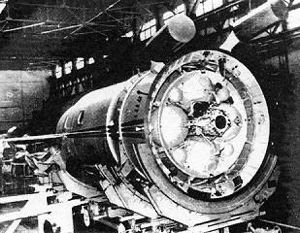 In the first part of August 1965 VPK Head Leonid Smirnov ordered that urgent measures be taken to test manned military techniques in orbit at the earliest possible date. Modifications were to be made to the Voskhod and Soyuz 7K-LOK spacecraft to assess the military utility of manned visual and photographic reconnaissance; inspection of enemy satellites from orbit; attacking enemy spacecraft; and obtaining early warning of nuclear attack. These directions were embodied in the Central Party resolution of 24 August 1965, which instructed Kozlov's KB to fly by 1967 a military research variant of OKB-1's Soyuz 7K-OK 11F615. The new spacecraft was designated the 7K-VI by Kozlov and had the project code name 'Zvezda'. Initially the instructions were followed and the 7K-VI was not very different from the 7K-OK. It used the same structure, and had the modules in the same sequence. The standard Soyuz orbital module would have the military research equipment installed in it. But in the beginning of 1967 Kozlov decreed a complete revision of the design. On the first orbital launch of the 7K-OK in November 1966 a large number of failures occurred, indicating many problems in design and quality control. The spacecraft was uncontrollable and was finally destroyed by the on-board APO destruct system. On the second launch attempt on 14 December, the Soyuz incorrectly detected a failure of the launch vehicle at 27 seconds into the flight. The launch escape system was activated, pulling the capsule away from the vehicle. Analysis of the failure indicated numerous problems in the design of the escape system. In order not to inherit the problems of the Soyuz, Kozlov ordered a complete redesign of the 7K-VI. In the first quarter of 1967 the revised design was issued. The new spacecraft, with a crew of two, would have a total mass of 6.6 metric tons and could operate for a month in orbit. 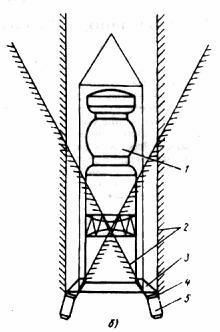 However the 11A511 launch vehicle could only put 6.3 metric tons into the design orbit. This would limit the crew to one. However the military objected to this. A second cosmonaut, without a spacesuit, but with life support systems and consumables would take another 400 kg of payload. In order to meet the military requirements, Kozlov designed a new variant of the Soyuz launch vehicle, the 11A511M Soyuz-M. The project as reformulated was approved by the central committee on 21 July 1967 by the Central Committee of the Communist Party, with first flight to be in 1968 and operations to begin in 1969. The new version switched the positions of the Soyuz descent module and the orbital module. The descent module was now at the top of the spacecraft. Behind the seats was a hatch for access to the cylindrical orbital section, which was larger than that on the standard Soyuz. The crew of the spacecraft was two, as required by the military. Unlike other models of the Soyuz, the crew seats were not arranged in a row against the bottom of the pressure cabin, but in tandem. This allowed the instruments to be arranged about the sidewalls of the capsule. According to some reports, ejection seats were fitted and the Soyuz escape tower was eliminated. Above the descent module was a recoilless gun developed by the well known Soviet designer A E Nudelman. It was designed for shooting in a vacuum and defending the military research spacecraft from enemy satellite inspector and interceptor satellites. The gun was aimed by maneuvering the entire spacecraft. A special gunsight was installed in the descent module for aiming the gun. A difficult technical problem for the designers was how to fire the gun without putting the Zvezda into uncontrollable somersaults. To solve the problem a special dynamic stand was constructed - a platform on air bearings. In it was installed a dummy 7K-VI with an optical gunsight. 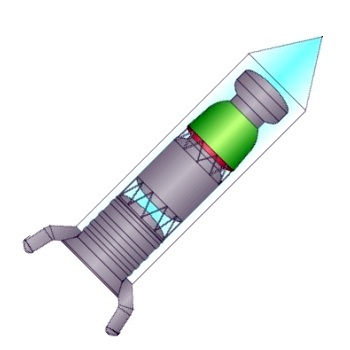 Tests with the stand proved that the cosmonaut could aim the spacecraft with a minimum expenditure of fuel, keep the spacecraft pointed at the desired target, and that the firing itself would not put the spacecraft into any gyrations that the cosmonaut could not cope with using manual control. It was also considered to equip the SA with a docking collar. This would allow the spacecraft to dock with the Almaz space station. The docked configuration 11F73 7K-VI and 11F71 OPS Almaz was given the official index number 11F711. A point of concern was the cutting of the hatch through the heat shield of the capsule. Mishin, Chief Designer of Kozlov's parent office in Kaliningrad, was concerned that this would cause problems during re-entry. The engineers at Samara proved that it would not have any negative effects. As later proved by testing of such hatches in the Gemini 2 and TKS VA re-entry vehicles, they were correct. Installed in the orbital module were various instruments for military research. At a lateral position was a radar illuminator slaved to the main instrument - the optical sight OSK-4 and its photo apparatus. A cosmonaut would aim the sight at targets on earth's surface from a special bicycle-like aiming saddle. Also installed on the illuminator was the Svinets apparatus for observing the launch of ballistic missiles. On the exterior of the orbital module were long booms with direction finders for radio-location of enemy satellites and ELINT. The heavy weight of the associated batteries. The operational limitation of having to keep the spacecraft oriented toward the sun in daylight. Failure of deployment of the panels in flight could have disastrous consequences, as the flight of Soyuz 1 had shown. The military experiments required a great deal of energy. Therefore RTG's, fuelled with plutonium, were selected. Because of the valuable nature of the fuel, and to prevent release of radioactive material on re-entry or in case of accidents, the RTG capsules were mounted in re-entry capsules and were actually located outside of the payload shroud during launch. They were to be recovered and reused after each flight, and could be ejected in emergencies. The final layout of the 7K-VI was very similar to that of the American MOL. Like the MOL, it featured the return capsule at the front, with a hatch in the heat shield leading to the orbital compartment, followed by the equipment-engine module. This was no accident; after 1966 the open specialized journal 'Raketno-kosmicheskaya tekhnika' no longer featured articles on the MOL. Thereafter all material relating to the MOL was gathered from KGB intelligence sources and was passed to Samara for reference in the design of the VI. Work went rapidly; by the middle of 1967 the mock-up and dynamic stand for testing of the Nudelman gun were completed. All materials for the approval of the draft project by the expert commission were completed, and drawings were released for both the Zvezda and the Soyuz-M launch vehicle. Meanwhile the cosmonaut group that would train for the VI was formed in September 1966. The commander was Pavel Popovich, and other members were pilot Alexei Gubarev, and flight-engineers Yuri Artyukhin, Vladimir Gulyaev, Boris Belousov, and Gennadiy Kolesnikov. Popovich-Kolesnikov and Gubarev-Belousov were the prime crews, with the other engineers acting as reserves and to be assigned to later crews. These arrangements quickly changed however, since there were so many manned spaceflight projects underway. Popovich actively worked on the VI, visiting Samara, inspecting the mock-up, and testing the gun firing rig. But he and Artyukhin had also managed to be informally assigned to the 7K-L1 circumlunar training group on 18 January 1967. During 1967 Popovich, Shatalov (between Voskhod-3 and 7K-OK), Gubarev, Artyukhin, Voronov (all moving to 7K-L1), Zaikin, Beregovoi and Gulyaev all were briefly assigned to the VI. By the beginning of 1968 the only cosmonauts remaining in the group were Gubarev and Zaikin, with Gubarev as the commander. The losses were made good by new cosmonauts recruited especially for the program from the ranks of the PVO Straniy (the air defense forces). These cosmonauts were selected on 12 April 1967 and were all scientific-engineering specialists. They included V G Kalinin, Vladimir Alekseyev, Mikhail Burdaev, and Nikolai Porvatkin. They all had worked in military space research, and Budarev had specialized in space interceptors. A large cadre was certainly necessary; it was planned to launch no less than 50 Soyuz-VI missions in the period 1968 to 1975. By August 1967 Kozlov was predicting first flight of the VI in 1968, although the director of the Progress factory where it was being built more realistically put the first flight in 1969. At this point, the Chief Designer of OBK-1, Vasiliy Pavlovich Mishin took an interest in the VI. On 13 October 1967 Mishin began his efforts to take over Kozlov's VI program. His staff in Kaliningrad felt that Kozlov had insulted them by redesigning the VI to rectify the 'defects' of their Soyuz 7K-OK design. They were also fundamentally opposed to the use of radio-isotope power sources, and raised interminable objections about the 800 mm hatch cut into the heat shield (as they did later in the case of Chelomei's VA). Especially after the heat shield failure of a 7K-OK in January 1967 and its subsequent sinking in the Aral Sea, the Podpliki 'Mafia' relentlessly criticized Kozlov about the heat shield design. Mishin wrote a letter to Afanasyev and Smirnov, urging them to cancel the 7K-VI program. In the place of the Kozlov's 7K-VI Mishin proposed his own project for an orbital station 11F730 Soyuz VI. This would consist of on orbital block 11F731 OB-VI and a transport spacecraft 11F732 7K-S. This was the exact same concept as Kozlov's cancelled Soyuz-R system, but using Kaliningrad spacecraft in the place of Samara spacecraft. In a November 1967 meeting between Mishin and Kozlov Mishin demanded the abandonment of Kozlov's 7K-VI project. Kozlov rejected this and subsequently attempted to recruit Kamanin to his cause. It was all for naught; through various complex machinations Mishin seized control of the project on 8 December 1967. Mishin's 7K-VI would eventually be cancelled in turn in 1969. However the 7K-S ferry developed for it would fly in the 1970's and eventually become the Soyuz T and Soyuz TM, still in use today. Kozlov moved on to further developments of unmanned satellites. In the decree 220 of 24 July 1967 and others Samara was directed to begin development of the advanced photo reconnaissance satellite Yantar-2K. The design of this satellite benefited from much of the work on the 7K-VI. Crew Size: 2. Habitable Volume: 11.00 m3. Family: Combat spacecraft, Soviet Space Stations, Surveillance orbit. Country: Russia. Launch Vehicles: R-7, Soyuz 11A514. Agency: Kozlov bureau. Bibliography: 102, 121, 344, 367, 376, 445, 474. Soyuz VI. 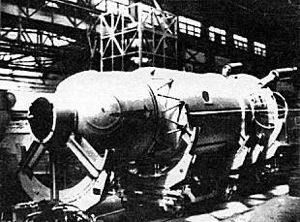 Aft view showing standard Soyuz engine installation and RTG nuclear-thermal electric power generators on booms extending from base. Soyuz VI according to a published sketch. Note the payload shroud has no launch escape tower and the encapsulated RTG nuclear generators positioned outside the shroud. Soyuz VI, according to the appearance of the mock-up. The mock-up did not have the gun package mounted forward of the descent module. 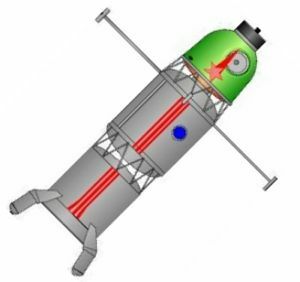 Drawing from an article by Samara chief designer Kozlov showing a Soyuz-VI-like spacecraft with two nuclear thermal generators, with the radiation shadow zones indicated. 1965 August 1 - . Development of military versions of Voskhod and Soyuz approved. - . Nation: Russia. Related Persons: Krylov, Smirnov, Vershinin. Program: Voskhod. Flight: Soyuz VI Flight 1, Voskhod 3, Voskhod 4, Voskhod 5, Voskhod 6. Spacecraft: Soyuz VI, Voskhod. Military-Industrial Commission (VPK) Decree 'On creation of military Voskhod and Soyuz spacecraft' was issued. Eight days later, Kamanin receives the resolution, signed by Marshal Zharkov, countersigned by Smirnov. Krylov, Vershinin, Sudts, and Gorshkov are ordered to immediately begin military space research aboard Voskhod and also develop a special version of the Soyuz spacecraft for visual and photographic military reconnaissance, satellite inspection, interception in orbit, as well as development of nuclear missile early warning systems. This is old hat to Kamanin. Krylov has no interest in military spacecraft, and will not implement the order. 1965 December 8 - . Soyuz VI - . Nation: Russia. Related Persons: Gorbatko, Volynov. Flight: Gemini 7, Soyuz VI Flight 1, Voskhod 3. Spacecraft Bus: Soyuz. Spacecraft: Soyuz VI, Gemini. Kamanin meets with an engineering delegation from Kuibyshev. They are seeking a close relationship with the cosmonaut cadre in development of the military reconnaissance version of Soyuz, which they are charged with developing. They have already been working with the IAKM for over a year in establishing he basic requirements. Kamanin finds this refreshing after the arms-length relationship with Korolev's bureau. Meanwhile Gemini 7 orbits above, and there is not the slightest word on the schedule for Volynov-Gorbatko's Voskhod 3 flight, which would surpass the new American record. 1966 March 12 - . Mishin lists the projects DI Kozlov was developing in Samara - . Related Persons: Mishin. Spacecraft: Soyuz, MKBS, Soyuz VI, Soyuz 7K-S.
3. MKBS multipurpose space base station (preliminary project) - specification requirements. Soyuz-VI to fly by end of 1967. - . Nation: Russia. Related Persons: Kozlov. Program: Almaz. Class: Manned. Type: Manned spacecraft. Spacecraft Bus: Soyuz. Spacecraft: Soyuz VI. Resolution 'On approval of work on the 7K-VI Zvezda and course of work on Almaz' no. 305 ordered Kozlov's filial 3 of OKB-1 to undertake first flight of the manned military research spacecraft 7K-VI - 11F73 Zvezda by the end of 1967..
USSR Defence Ministry issued a requirement for an "Orbital Research Station" (OIS) - . Nation: Russia. Related Persons: Kozlov, Mishin. Spacecraft: Soyuz 7K-S, Soyuz VI. The Chief Designer of OKB-1, Vasiliy Pavlovich Mishin, strongly disagreed with the Zvezda design. In the place of Kozlov's 7K-VI Mishin proposed an OIS consisting of a separately-launched orbital block and a transport Soyuz. This was the exact same concept as Kozlov's cancelled Soyuz-R system, but using Kaliningrad spacecraft in the place of Samara spacecraft. 1967 July 21 - . US Project reassigned; R-36-O booster development approved; Yantar-2K and Zvevda 7K-VI approved. - . Nation: Russia. Related Persons: Kozlov. Spacecraft: Soyuz VI, US-A, US-P, Yantar-2K, Yantar-4K1. Decree 715-240 'On the Creation of Space Systems for Naval Reconnaissance Comprising the US sat and the R-36-based booster -further work on the US naval reconnaissance satellite, approval of work on the Yantar-2K, and course of work on 7K-VI Zvezda'. 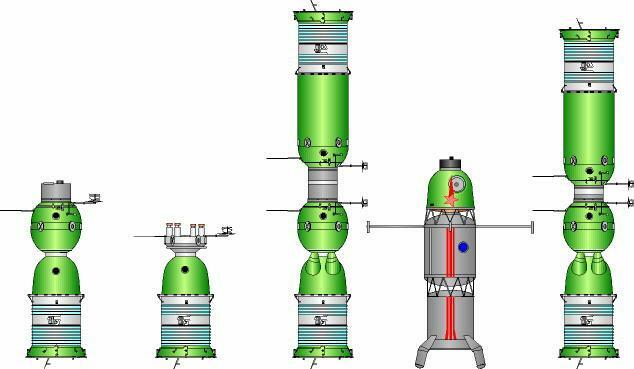 An entire family of Yantar spacecraft was proposed by Kozlov's design bureau during the initial development; information on two film return models has been declassified. Yantar was initially derived from the Soyuz spacecraft, including systems developed for the Soyuz VI military model. During design and development this changed until it had very little in common with Soyuz. Following numerous problems in the first flight tests of the Soyuz 7K-OK, Kozlov ordered a complete redesign of the 7K-VI manned military spacecraft. The new spacecraft, with a crew of two, would have a total mass of 6.6 tonnes and could operate for a month in orbit. The new design switched the positions of the Soyuz descent module and the orbital modules and was 300 kg too heavy for the standard 11A511 launch vehicle. 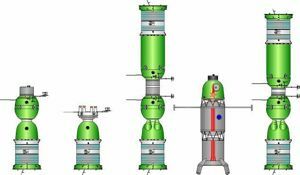 Therefore Kozlov designed a new variant of the Soyuz launch vehicle, the 11A511M. The project was approved by the Central Committee of the Communist Party, with first flight to be in 1968 and operations to begin in 1969. The booster design, with unknown changes to the basic Soyuz, did not go into full production. First flight of Soyuz VI planned for 1968 - . Nation: Russia. Related Persons: Kozlov. Spacecraft Bus: Soyuz. Spacecraft: Soyuz VI. Kozlov was predicting first flight of the VI in 1968, with the first all-up operational flight in 1970..
1967 August 31 - . 7K-VI Zvezda program review. - . Nation: Russia. Related Persons: Darevskiy, Kozlov. Spacecraft Bus: Soyuz. Spacecraft: Soyuz VI. The 7K-VI military Soyuz was supposed to have been built on the basis of the 7K-OK model, with a first flight in December 1967. After all the problems with the 7K-OK, Kozlov replaced most subsystems and ended up with a basically new spacecraft, the Zvezda, which will have a mass of 6.3 to 6.6 tonnes. Officially first flight was set for the second half of 1968, but Kozlov says that even a flight in 1969 may not be possible. They simply can't meet the 21 July 1967 decree to have the spacecraft in service in 1968 - they need a further 18 to 24 months of development time. In Kamanin's opinion, this whole approach has been mismanaged. Urgent military experiments could have been flying long ago on a series of Voskhod flights. Furthermore there is no trainer yet for the 7K-VI. Kozlov says simply that he is not responsible for providing a trainer. Resort has to be made to a new design bureau set up specifically to produce simulators, headed by Darevskiy. 1967 October 13 - . Mishin seeks cancellation of 7K-VI. - . Nation: Russia. Related Persons: Afanasyev, Sergei, Mishin, Smirnov. Spacecraft Bus: Soyuz. Spacecraft: Soyuz VI. Mishin sends a letter to Afanasyev and Smirnov, proposing to cancel the Kozlov's 7K-VI military version of Soyuz. It is an unnecessary new spacecraft design, he says. As an alternative Mishin proposes to double to 8 to 10 the number of flights of the existing Soyuz design planned for 1968. Kamanin is astounded. Mishin was never opposed to Kozlov's 7K-VI before. No one had ever indicated that the VI had to be a precise copy of the Soyuz. The military is opposed to the move. On another matter, Kamanin sends a letter to Mishin, complaining about the L1 trainer provided - the simulator is not representative of the actual spacecraft. Meanwhile the second test of a Soyuz mock-up is made at the parachute trials at Fedosiya. It proceeds normally, and the test clears the way for an unmanned space flight of the redesigned Soyuz. 1967 November 29 - . Kamanin appeals for 7K-VI program to continue. - . Nation: Russia. Spacecraft Bus: Soyuz. Spacecraft: Soyuz VI. Kamanin writes a letter to the Central Committee on the need for the 7K-VI spacecraft for military research. He also complains about his problems in obtaining adequate spacecraft simulators. Later he meets with Grigoriy Nikolayevich Postukov, sculptor of cosmonaut statutes. 1967 December 6 - . 7K-VI cancelled. - . Nation: Russia. Related Persons: Keldysh, Mishin, Pashkov, Serbin, Smirnov, Stroganov, Ustinov. Spacecraft Bus: Soyuz. Spacecraft: Soyuz VI. Kamanin is dumbfounded. The leadership has decided to accept Mishin's recommendations, scrap the 7K-VI project, and replace it with a Soyuz variant! Mishin is an egotist, but he is supported by highly-placed leaders - Ustinov, Smirnov, Pashkov, Serbin, Stroganov, Keldysh, and others. So everyone in the space program has to dance in the service of this 'engineer-performer', who is not a credible chief designer. 1968 February 17 - . Soyuz VI cancellation approved. - . Nation: Russia. Related Persons: Afanasyev, Sergei, Kozlov, Mishin. Spacecraft Bus: Soyuz. Spacecraft: Soyuz VI. The NTK General Staff approves Mishin's cancellation fo the 7K-VI. Kozlov has agreed only under duress. The military is opposed to the cancellation, but Afanasyev won't listen to them..